Dr. Karuna Raja received her primary medical degree from Agra University in India. She has a Masters degree in Occupational Health and Safety from the University of Sydney. She completed her obstetrics and gynaecology training in Sydney, Australia and has been a fellow of the Royal College of Obstetricians and Gynaecologists (FRANZCOG) for over a decade. 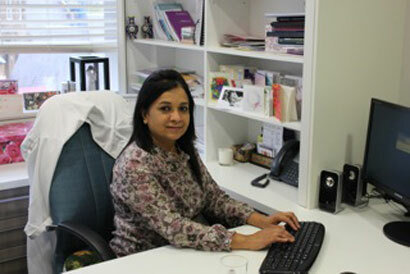 Dr Raja has been a specialist in Obstetrics and Gynaecology for over 14 years. Dr. Raja is a Visiting Medical Officer at the Royal Prince Alfred Hospital in Sydney, Australia, and also helps to train the next generation of O&G specialists at Sydney University Medical School. Dr Raja was also a Fellow in pelvic and laparoscopic surgery for three consecutive years at Sydney’s Liverpool Hospital and Royal Prince Alfred Hospital. She has extensive knowledge and experience in obstetrics and gynaecology with a special interest in high risk obstetrics, menstrual disorders and urogynaecology. Dr Raja is also a senior clinical lecturer in Obstetrics and Gynaecology at Sydney University Medical School. For the last 7 years, Dr Raja has also been the Integrated Training Programme co-ordinator for Royal Prince Alfred Hospital (Women and Babies). Dr Raja is also responsible for overseeing the training of obstetrcis and gynaecology registrars in the training programme at RPA Hospital. Dr. Karuna Raja is a Fellow and a Member of the Royal Australian and New Zealand College of Obstetrics and Gynaecology (RANZCOG), a member of the Australian Gynaecological Endoscopy Society (AGES), a Member of the Australasian Menopause Society (AMS), a Member of the International Urogynaecology Association (IUGA) and a Member of the Medical Advisory Board of the Family Planning Association of Australia (FPA).